The Jim Corbett National Park is situated in the Nainital district of Uttarakhand and is the oldest national park in India which got established in 1936 by the name of Hailey National park. After India’s independence the park was named as Ramganga National Park but later in 1956, it was renamed after Jim Corbett – the famous hunter turned conservationist and author, who played a major role in the establishment of the national park. Jim Corbett National park is one of the renowned Wildlife Sanctuary in India and is popular for the Royal Bengal tiger present in the sanctuary. The park contains 488 different species of plants and wide variety of wild life including Elephants, Tigers, Chital, Sambar Deer, Nilgai, Gharial, King Cobra, Muntjac, wild boar, Hedgehog, common Musk Shrew, Flying fox, Indian Pangolin, and around 600 different species of birds. Jim Corbett National Park covers an area of 521sq. kms. 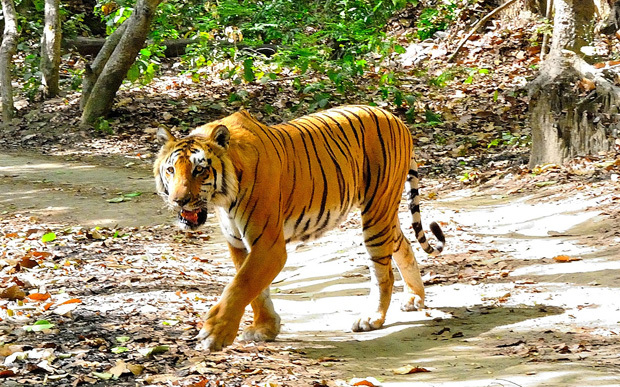 Corbett National Park acts as a protected area of critically endangered Bengal Tiger of India. Corbett National Park is one of the best managed and protected areas in the country and attracts thousands of Indian and Foreign visitors each year. the park is situated at the foothills of Himalayan belt and has various geographical and ecological characteristics with splendid landscapes. There are four gates which acts as entrance to the Park, which are Amdanda gate, Dhangarhi gate, Khara gate and Durga devi gate. If you are an adventure freak, bird watcher, angler, or animal lover then Jim Corbett National Park is the ideal place for you. Please Note: It is always advisable to book safaris prior to arrival, especially during weekends as there are only 60 vehicles allowed inside the Corbett National Park at a time. Depending on the number of guests, the estimated cost of safari vehicles will be between Rs 2600 – Rs 4000. Guests can directly contact the hotels and book their safaris. Jhirna: A densely wooded and grassland habitat, it makes for excellent bird viewing. The Great Hornbill is found in abundance here. Jhirna is home to a population of sloth bear and wild elephants and a growing tiger population. A large grove of ‘Flame of the forest’ adds drama to Jhirna. A strong prey base of nilgai, cheetal, sambhar and the wild boar also makes it an attractive area for the big cats, while a resident wild elephant and sloth bear population offer great sighting opportunities. Bijrani: These forests range from those of pure Sal on the upper reaches, to deciduous mixed forests in the valley, along with three major grasslands. It sustains a variety of herbivores, and has a wide network of jungle roads, making Bijrani excellent tiger sighting territory. carved out of a shooting block, with a wide network of criss–crossing jungle roads, offers excellent tiger sighting opportunity. On Corbett’s eastern boundary, Bijrani’s forests are dense with a wide variety of vegetation: of pure Sal forests on the upper reaches and tropical moist, deciduous mixed forests in the valley and plains. Excellent water availability throughout the year and wide grasslands make it an exceptional habitat for a strong prey base and its predator. Dhikala: This is the largest and most varied zone in Corbett, offering the best opportunities for overnight stays. Dhikala contains a diverse range of habitats: its higher reaches suit Ghoral, a goat antelope, while the Gharial and Maggars, as well as the great Mahaseer, inhabit the rivers below. The hog deer is also exclusive to Dhikala. Dhikala offers the most varied terrain in all and, if booked well in advance, the widest range of Forest Rest House accommodations in the park. This block of forest has the Ramganga river stretch through its middle, emptying into a wide, multiple–necked reservoir. Durga Devi: This range is famous for bird watching and fishing ‘Mahasheer’, a large fish species. Durga Devi is at north–east corner of Corbett Park, birds species like maroon orile, great headed fishing eagle, little forktail and many more. Mandal and Ramganga river in this forest attracts wild elephants, leopards and Tigers. Sonanadi: A centre range in the Corbet National Park, Sonanadi range is famous for wildlife beauty with amazing flora and fauna. Over 550 species of birds are recorded here with leopard, tiger, cheetal, sambhar and raptiles. Phato: This zone provides buffer forest to southern Corbett, comprising mostly of plantation forests. The climate in the Corbett National Park is temperate. Corbett National Park closes during the monsoon rainy season from Mid June to Mid November. Summers (March to June): touch 40°C and the average temperature is about 30°C. Tourists can move around the Park during this season. The scorching heat of the sun becomes quite unbearable for the animals as well as the inhabitants. Monsoons (July to September) offer heavy rainfall: there can be light rainfall intermittently through the whole year. The weather becomes quite pleasant with the drop in temperature. The major regions of Corbett are closed for the tourists during the rainy season because this is primarily the mating season of most of the animals. However, the Jhirna (gate) region of the park is open throughout the year and tourist can visit and enjoy rainy season with wildlife safari. Winters (December to February): Have a temperature variation of 5 to 25°C. Winter mornings are foggy and the months range from November to February which are ideal to explore the bounds of the park. During this time, the park heartily welcomes all the tourists. The weather is balmy during this time of the year. Best period to visit here is from November to June, mainly before and after heavy monsoon. November to June is good for spotting animals and also to enjoy the scenic surroundings. July to October is good for sight seeing in the downhill region.